Ok so i was rummaging throught my parts box and i found 3 spare yoyojam bearings that were siezed up. These things had been cleaned previoulsy a number of times, but havent been consistently cleaned for over a year. I would flick them and id be lucky to get 1second spin on them. I used a piece of rubber from an eraser pencil that i sharpened with a pencil sharpener to get a point so i could fit various sizes on there. All you do is put the dry (cleaned), siezed up bearing on the rubber and turn the motor on. Then, grab hold of the outer race of the bearing to simulate what it would be spinning like inside the yoyo. It takes about 30 seconds to free up the bearing. It may take a few goes and a few practice throws to get it fully freed up up its sure easier than throwing the yoyo around to free it up. Also, you dont even need to take the bearing out of the yoyo to use it. 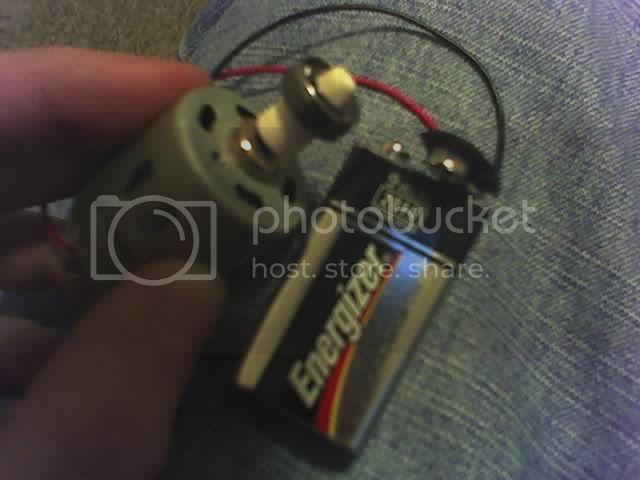 You can turn the motor on and apply the rubber to the side of the bearing while its still in the yoyo and it would work just the same (would only work like this for yyj). So now i have 3 totally clean and free spinning yyj bearings from 3 siezed up, crappy, un-useable yyj bearings. OxxiÂ² wrote: what is that thing? That largeish body of text? Where the pic is? Yeah, that... thats my post. Its a motor, with 2 wires, a battery, a piece of rubber and a yoyojam bearing. 1) YYJ bearings have a tendnecy to sieze up and stop spinning, the motor fixes this in about 30 seconds where it would normally take considerably longer using a spinning yoyo. 2) Bearings perform best once they break in (throw a stock yoyo for a while, and after that while, it will be spinning longer than at first due to the bearing being "broken in"). 3) This motor contraption can help dry a wet bearing after cleaning it. 4) This motor contraption can also clean tarnished bearings to help get them back to their original shiny glory. what a clever guy you are Mark! well done! all those things are hideous. OxxiÂ² wrote: all those things are hideous. You do realise that had you read my post to begin with and had not asked a silly question, you wouldnt have received a silly answer and there would be no need for either of us to be smart arses to eachother? "what kind of motor is that?/where can i get one?" we could have avoided the filler also. but since when was this board about conserving webspace?